The mobile market, everyone agrees, is the technology industry’s future. What’s not so clear is which company is best positioned to thrive in that future. For smartphones in particular, the traditional metrics are confusing. Android has 70% market share, but Apple is taking 70% of the profit. Google, meanwhile, is not benefiting from Android’s market share dominance as much as Samsung, which recorded $4 billion in profit from its cellphone and telecom business in Q4 2012. In the same quarter, Google made less—$2.89 billion—from all its businesses combined. And when it comes to selling actual smartphones, the only two companies making any money are Apple and Samsung. So who’s winning? When pondering this, I find myself thinking about dependencies. What is each company doing for itself, and in what ways does each company rely on others? I think this balance, much more than profits or market share, is what will determine long-term success. Let’s see how the players stack up. Google’s Android strategy looks a lot like Microsoft’s Windows strategy of yore—minus the part where you collect all the money. Google got the other parts right, though: create a viable platform, support it, evangelize it, and get as many other companies as possible to use it. That last part is made a lot easier when the OS is free and open source, of course. In the PC’s heyday, Compaq, Dell, HP, Gateway, and others all killed each other selling PC hardware, grinding their profit margins down to almost nothing, leaving only a few players (barely) standing in the end. Microsoft, meanwhile, sat back and collected the same fat software margins from all of them (and from nearly all of their customers, as well). With Android, Google seemed to posit that there was value inherent in being the platform “owner,” even if hardware makers didn’t pay for each copy of the OS. Android was filled with connections to Google’s (also free) services. More people using Android meant more people seeing Google ads, which meant more money for Google. In the early days of Android, this theory looked promising. As in the PC era, hardware makers jockeyed for position in the nascent Android market. Individual fortunes rose and fell, but the number of Android activations just kept growing. So far, so good. But unlike the early PC market, the Android market hasn’t produced a group of strong competitors duking it out at the top. As previously noted, only one company, Samsung, is making any money at all selling Android smartphones—and it’s making more from them than Google itself. From the beginning, Google has shrewdly hedged its bets by fielding its own line of Android hardware. More recently, Google purchased Motorola, giving it its very own bona fide handset maker. Thus far, none of these efforts have produced Samsung-like numbers. But it’s clear that Google is unwilling to be entirely dependent on other companies to create the hardware that its mobile OS needs to be a complete product. Samsung seems like an Android success story. Previously better known in the US for its TVs than its smartphones, Samsung combined its hardware manufacturing prowess (and its shameless willingness to copy other companies’ design cues) with Google’s mobile OS to produce profitable phones that customers love. Though the Galaxy line of devices would not be possible without Android, Samsung is far from Google’s ideal of a dutiful Android licensee, selflessly ferrying customers to Google’s services. Just as PC makers used to insist on adding their own graphical shell or other brand-specific “enhancements” to their Windows PCs, most companies selling Android-based hardware products feel compelled to put their own stamp on the vanilla Android experience. Samsung is no different, steadily papering over the underlying Android OS with each new release of its TouchWiz user interface. And why not? If Android is a money-loser for every other smartphone maker, Samsung is obviously doing something right. In its recent ill-conceived Galaxy S4 launch event, Android was barely mentioned at all. Samsung’s dependence on Android is clearly chafing. In truth, Apple has been bitten more than once by its dependence on other companies. The viability of the Mac once depended on Microsoft’s willingness to produce a decent version of Office for it. Later, the Mac faltered multiple times when IBM and Motorola were unwilling or unable to produce competitive desktop and laptop CPUs. When Apple wanted to revamp its OS, Adobe and Microsoft were unwilling to port their software, forcing Apple back to the drawing board. Then there was that time when Apple asked another company to make a phone. Like a lover who’s been betrayed one too many times, Apple has hardened its corporate heart against any form of true partnership. If it’s important, Apple wants to own and control it. When Apple does work with others, it insists on having the upper hand. iOS developers serve at the pleasure of Apple. Manufacturing partners must fight for the privilege of building Apple’s products, often using equipment Apple purchases for them. And, of course, Apple has its own mobile OS that runs exclusively on its own hardware. As God is its witness, Apple will never be hungry again! Steve Jobs personified this attitude, which is why he felt so deeply betrayed when Google, his partner on stage during the iPhone introduction, remade Android in iOS’s image. After that, Apple’s reliance on Google for essential parts of its mobile experience simply could not stand. The trouble is, online services have not historically been Apple’s strength. That’s why it partnered with Google, Yahoo, and others in the first place. It took Apple several years (and several acquisitions) to finally replace Google maps—and the results were not ideal. Even among just these three companies, there are more than enough dependencies to go around. Google depends on other companies to make and sell the vast majority of the products that run its mobile OS. Samsung depends on Google to make and support the most important software component of its flagship mobile devices. Even the fiercely independent Apple still depends on Samsung to manufacture many of its mobile processors (for now…) and Google to provide web search services—and perhaps to give a little help with maps as well. Back to the original question: who has the upper hand? Yes, there are dependencies in all directions—but not all dependencies are created equal. 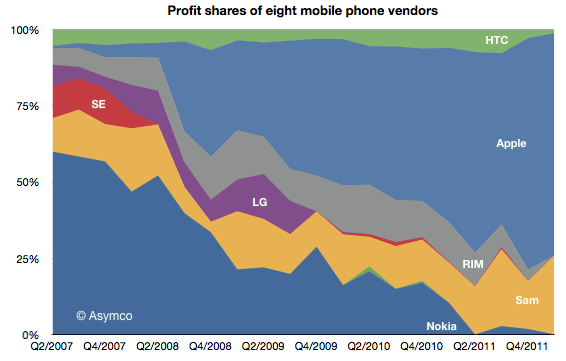 Despite its recent success, Samsung remains in the weakest position. It clearly doesn’t want to remain beholden to Google, and that’s the right instinct. But I’m not confident in Samsung’s ability to completely divorce its mobile platform from Android. I just don’t think it has the experience or expertise to be a real platform owner. Furthermore, while Android’s market share may be overwhelming, Samsung’s is not. Even if Samsung had the skills to take the reins of its software stack, it’d have to maintain compatibility with present and future versions of Android, lest it become just another low-volume also-ran smartphone platform. Google’s present position looks weak, but it has two big trump cards. First, Google has proven to be one of the few companies capable of creating, popularizing, and supporting a platform. Despite all the skinning and branding by handset makers, Google is still the driving force behind Android. This power can only be negated by another company that’s willing and able to match Google’s Android efforts on all fronts: OS development, app store, developer tools, evangelism, the works. That’s a tall order. Second, Google is still the king of online services. Apple, the biggest technology company in the world, just tried to replace maps, one of Google’s second-tier services, and barely avoided disaster. Microsoft, the former undisputed ruler of the tech sector, has been trying for years to challenge Google for the web-search crown, with little success. Maps and search are not obscure or obsolete services. If you can’t create equal or better alternatives—and so far, no one has—then you’re stuck relying on Google. Google still needs hardware partners to maintain its Android empire, but we already have a model for how a software-focused platform owner can dominate a market. It’s harder to imagine a hardware maker dominating while relying on a software platform controlled by someone else. Finally, there’s Apple, the jilted lover, feverishly working to eliminate any dependency that puts it at the mercy of a potential competitor. Apple remembers when Samsung was a great source of mobile CPUs and Google provided network services for iOS. Now look at those two traitors. No partnership is safe! And so, in addition to developing its own OS, designing its own hardware, producing many of its most popular applications (built in its own IDE using its own compiler and language), Apple now has its own mapping service, is designing its own mobile CPUs, and is trying to get someone other than Samsung to manufacture them—all the while presumably eyeing its other parts suppliers and software partners warily. Despite the bumps, Apple’s position remains strong. It’s got the best app ecosystem, competitive, trend-setting hardware, great adoption of each new version of its OS, and double the margins of the only other company making money selling smartphones. Oh yeah, and it dominates the tablet market too. There’s a lot for Apple to do in 2013, but at least it’s poised to succeed or fail on its own merits. In general, Apple needs to engage in more balanced partnerships that produce sustainable benefits on both sides. The switch to Intel CPUs is a good example, especially given how the situation has changed since the deal was first struck. In business, no strategic partnership is forever, but that’s no reason to avoid them entirely. And who knows? Perhaps Apple’s good relations with Intel will lead to its next great mobile SoC being manufactured at 22 or even 14nm. Let’s just hope Tizen doesn’t come up during the meeting.